Nice spicy raspberry and red cherry notes on the nose, with very light delicate silky tannins and sweet fruit vibrancy. Very concentrated red currant nose, great balance and elegance, and an earthy texture with some cumin and cinnamon complexity. Much more opulent rich wine, with darker berry notes, toasted nut complexity and a savoury finish. More blackforest and chocolate elements, and had a grainy tannin texture. Evolved in the bottle to show smokier toasty red currant fruit, with a dark nougat macadamia complexity on the palate. Different, presenting as quite stalky and brambly on the nose, but a little salty and warm on the palate. Quite spritzy and vibrant showing slight herbaceous notes. Much softer and more voluptuous, with the herbaceous characters evolving into ripe cucumber and capsicum. Showing bottle development of lovely rich kerosene, crushed hazelnut and walnut, volume and viscosity, lovely texture and length. 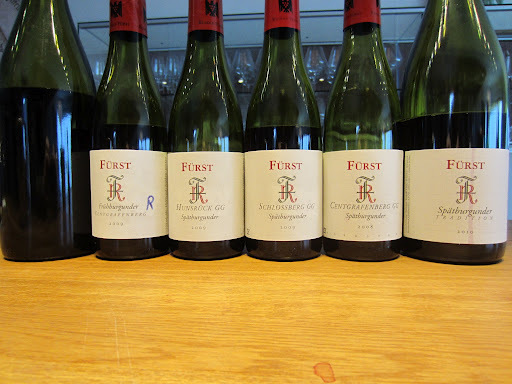 Amazingly rich and dense in colour and viscosity. There was a very creamy vanilla texture and flavour, combining with citrus to have a lemon custard character.